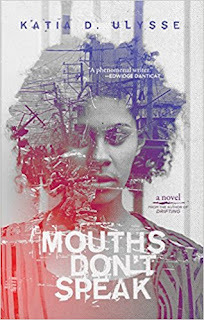 Katia D. Ulysse is the author of the new novel Mouths Don't Speak. Her other work includes the story collection Drifting. 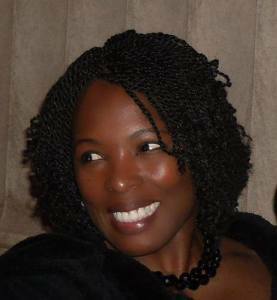 She has taught in the Baltimore City schools for almost 15 years. Born in Haiti, she lives in Maryland. Q: How did you come up with the idea for Mouths Don't Speak, and for your character Jacqueline? A: Hi Deborah. Thank you for giving me the opportunity to chat with you about Mouths Don’t Speak. Jacqueline Florestant, the protagonist in Mouths Don’t Speak, came to me long before I wrote the novel. The novel begins in the aftermath of the catastrophic earthquake that nearly annihilated Haiti in 2010; however, Ms. Florestant lived in my imagination long before then. She is flawed, as most of us are. She doesn’t have answers to her many problems. She’s a woman trying to keep sane, in the midst of tragic events. Before typing the first word on a page, I knew that Jacqueline’s husband, Kevin, was a Marine. I knew he was a combat veteran suffering from severe PTSD. I knew they were in love. I knew there was a child. I knew, also, that she had a very strong connection with Haiti; I was not sure exactly what that was until I sat down to write the story. I wrote and rewrote the story many times before I felt that I had explained the characters’ motives. I imagined these people, who turned out to be composites of dozens of characters; each has a strong story that I ached to tell. Q: You tell much of the story from Jacqueline's point of view, but you also view things from other characters' perspectives. Why did you choose to structure the book this way? A: I tell the story primarily from Jacqueline’s point of view, but there are instances where another character’s motives are so overwhelming that they take the reins—even from the writer, so to speak. I could have used safer means, and worked within the parameters of traditional storytelling, but I move within a story the way my great-grandmother told me stories. She shifted from character to character, giving each one—however peripheral—her own space to exist. There are characters in this book who probably could have been omitted, but these people are what the Haiti in this book are all about. People like the Florestant family drive past these characters daily; they think they know them, but have no real clue. 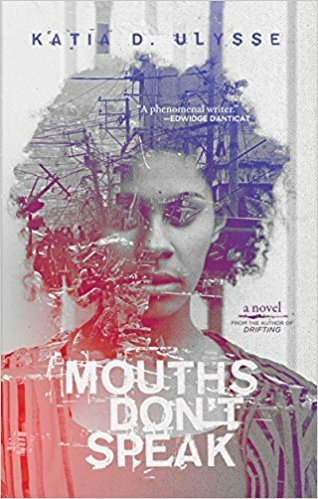 As I wrote and rewrote Mouths Don’t Speak, I experimented with other narrative devices, but in the end, it was mostly revelatory. The pieces fell into place; when I thought that the puzzle was done, I stepped back, took another look. Then another. Then another. Until I knew if I kept writing, I would have overwritten Jacqueline and everyone else in the story. Q: Given the current political situation in the U.S. and the focus recently on Haiti, what do you hope readers take away from your novel? A: Deborah, as you can see, the political situation in the U.S. and the focus on Haiti is always relevant. I don’t know a time when Haiti was not in the news. Most recently, the U.S. expressed concerns about Haiti’s president, Jovenel Moise’s, trip to Taiwan. It’s always interesting to notice how much people concern themselves with a country that’s supposed to be so insignificant. Recently, the president of the United States allegedly ditched the usual seven-word sobriquet, and called Haiti “S#!thole country.” We are used to being insulted, which is horrible. There are countless people working hard to change the narrative. People will always have negative things to say about Haiti; just as people will always have negative views of the United States. A: The title, Mouths Don’t Speak, comes from the second part of an ancient maxim the elders used to warn those among us whose loose lips can get us killed. Je wè. Bouch Pe. Eyes see, but mouths don’t speak. I can imagine that during certain dictatorships, keeping one’s mouth shut was a way to keep yourself and loved ones alive. When you witness atrocities, you have to choose between staying alive or denouncing them. The title is about keeping secrets—generational secrets that harm families now and in the future. I checked the good book, and got the confirmation I needed in Psalm 115: 4-8. This works so well for Jacqueline and the Florestant family. Psalm 115:4-8 New International Version (NIV) helped me out, too. A: Deborah, I’m working on a couple of things, but I am beyond distracted by the shocking wave of gun violence in the United States. Thanks to social media, we learn about these tragedies within seconds; we want to be there to help, but all we can do is read about them and watch events develop live on social media. Lately, it’s seems like there’s a shooting every single day. It’s Columbine over and over and over—with a staggering number of fatalities. One life loss is one too many. Parents are mourning all over the place. Las Vegas. Parkland, Florida. Santa Fe. It’s crazy. People talk about Haiti being unsafe. Ok. I live in Baltimore City, and I’m ready to move to the moon and take my chances with the legal aliens up there. Seriously. Last week alone, there were at least three shootings in schools in the country. Whether or not we gave birth in the traditional sense, we all have children for whom we are the responsible adults. We are supposed to be the grownups. We’re supposed to leave a decent world for forthcoming generations. At the rate we’re going, the entire globe will be one big “sh#!hole.” We can do better. Kids are scared. We have to do better. Before it’s too late. A: Yes. I’ve taught in a few of Baltimore City’s most dangerous schools for almost 15 years. I still work with the immigrant population, and see firsthand what happens when parents are separated from their children, not only at the border, but when mom and dad are ripped out of their living rooms or workplaces. Children go home from school and find their parents or guardians gone. Children are being forced to grow up faster than ever; they’re raising themselves and siblings. They drop out of elementary schools to get jobs at places that pay a fraction of the minimum wage—under the table. I see them leave high schools with one semester left before graduation, so that they can work full time to pay rent, other bills, and send money back to that place they cannot call “home.” They came here because America is supposed to be a dream, not the nightmarish kind. I want to make a difference in their lives. My new song, “Legacy,” is about these children and the children who will come after them. Legacy is asking: what do we plan to leave behind? We cannot take our gazillion $$$ with us, only our excuses. “Legacy” will be available soon. I plan to use all of the money to make living a little easier for my kids from Syria, Iraq, Rwanda, Afghanistan, Eritrea, Uganda, Tanzania, and Haiti. Some of these kids don’t even have pencils to use in the classroom. Forget about notebooks, winter coats, dinner at home, and prospects for higher education. These are actual human beings with tons of potential, but we’re overlooking that – because they’re from somewhere else. I hope it’s not too late when we realize that, in actuality, we’re all in this together. There’s nowhere to run. We’re all in this forever. Believe it. --Interview with Deborah Kalb. 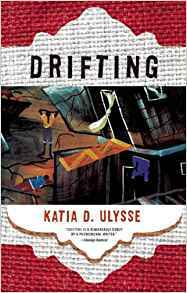 Here's a previous Q&A with Katia D. Ulysse.